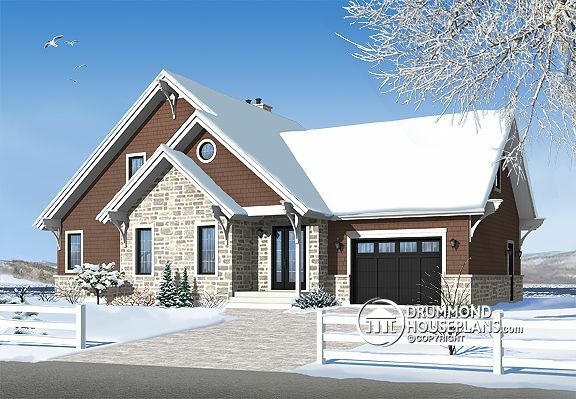 Following recurring requests for the addition of a garage to popular model 2957 and an adjustment to the kitchen to best relate to the new garage, we are pleased to provide this new and improved DrummondHousePlans interpretation of a perennial favourite. Outside, the addition of a garage balances nicely with the main body of the house and the rear of the house retains the charm of the original model. Inside, the kitchen faces the rear yard allowing for the placement of a wonderful master suite on the main level, complete with private bathroom, double closets and view of the rear via two french doors. The large and open activities area is bathed in light thanks to abundant windows and further enhanced by a dramatic vaulted ceiling and fireplace which are also shared by the adjoining dining room. The impressive kitchen with center island allows easy access to the back deck. The ground level amenities are completed by a laundry area and guest bathroom in a discreet location. An enjoyable upstairs includes a mezzanine, two bedrooms and shower room. A bonus room over the garage could be developed as a fourth bedroom, play room or media area. This model retains the famous charm of the original with additional features which are certain to be equally popular. Looking for other alpine house plans, ski chalet plans or vacation house plans? Check our Mountain Home and Ski Chalet Design Collection, Vacation Home Design Collection, or Create a “New House Plans – Latest Trends” Alert to receive all of the latest designs direct to you by email! ← Previous Post: What is the Future of Kitchen Technology?